What could be nicer in weather like this? Tropical flavours, a bit of alcohol and freezey cold on your tongue. I asked Hannah to pick out a recipe from David Lebovitz’s peerless ice-cream and sorbet manual, The Perfect Scoop, and this is what she went for. 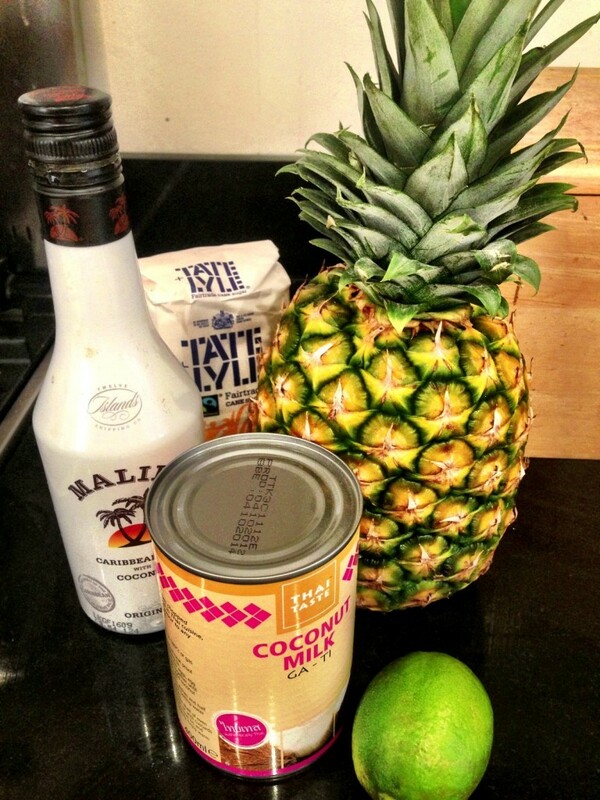 It couldn’t be simpler: a nice large ripe pineapple, 250g sugar, a can of coconut milk (not cream), a decent slug of rum and a squeeze of lime juice. Peel and core the pineapple, cutting off any gnarly bits, chop into chunks and blend with the other ingredients until smooth. I added a sprinkle of salt too, thinking it might sharpen up the flavour a bit. Give it a taste and adjust the rum and line to taste. Finally, churn the mixture in an ice cream maker. I noticed the Guardian recently posted a buyer’s guide to ice-cream makers. If I may add my two pence, I would definitely recommend getting one with its own refrigeration unit – pricey, perhaps – but the ease of use means you will definitely use it more than with a bowl type. I had a Magimix Gelato but it broke almost immediately, and was a bit rubbish when it was working. Now I have a Cuisinart ICE50BCU, and this is a great buy. It has a decent powered freezer unit, doesn’t require any alcohol to be added between the freezer and the bowl, and has been rock-solid reliability. The only issues are a slightly fiddly lid fitting, which has resulted in me snapping off a bit of plastic, and the noise. It is sufficiently noisy that I churn the ice cream in another room with the door closed. Can honestly say this is one of the best kitchen investments I’ve ever made. Did you use the Malibu? Or just plain rum? I used the Malibu as that’s all I had to hand, but I think a dark rum would be better as you don’t need the extra coconut flavour in the Malibu. Previous Previous post: Razor clams. Musings and some recipes.